PSF Spain went to Ecuador and performed for the victims of recent earthquake and refugees from Colombia. In May 2016, Clowns Without Borders USA went to Ecuador and did disaster relieving activities, by performing 21 shows for 6770 people. In March 2015, Clowns Without Borders Spain went to Ecuador and performed a show for 1000 people. In 2013, Clowns Without Borders USA went to Ecuador for their second year of partnership, touring and performing along Columbia/Ecuador border. They performed 8 shows for 1880 people. 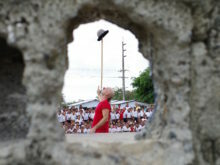 In 2007, Clowns Without Borders Spain implemented a project in Ecuador and performed 10 shows for 4000 people.